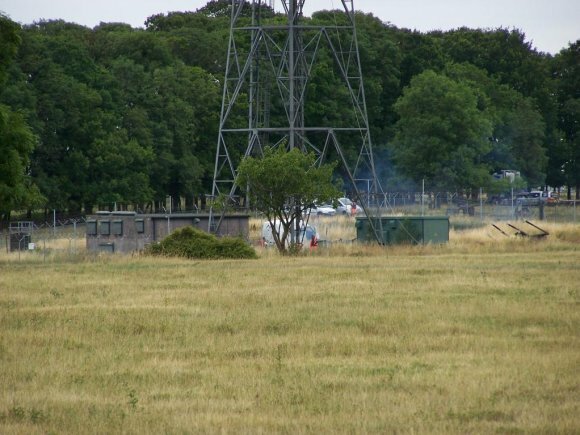 The microwave communications tower located at the south west end of the former RAF Chelveston site was one of many such towers in Europe, erected as part of the Digital European Backbone (DEB) project for the USAF. Originally installed in the 1970s and 1980s, the DEB ran from the United Kingdom across Europe to northern Italy. 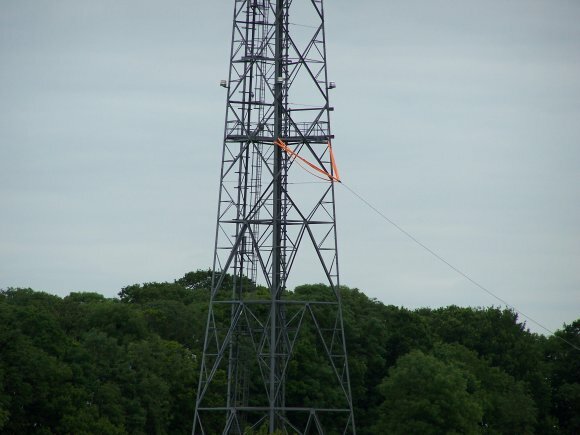 The tower was erected in 1985, along with the Unmanned Communications Building (UCB), and replaced an earlier aerial on the site. 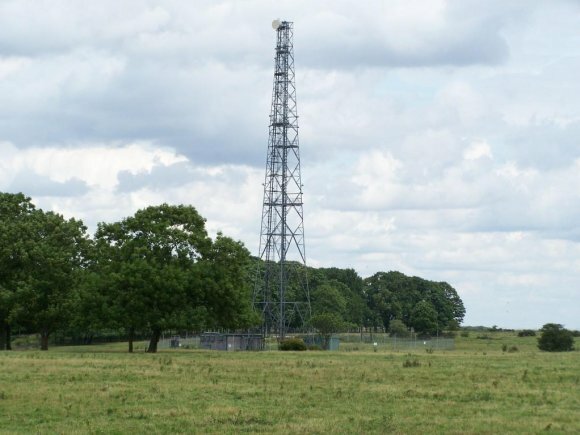 It provided line of sight microwave links to RAF Croughton and RAF Molesworth. With the end of the Cold War, the DEB became redundant. A team from the 1st Communications Maintenance Squadron, USAF, was deployed to a number of sites to deactivate them between 2005–8. 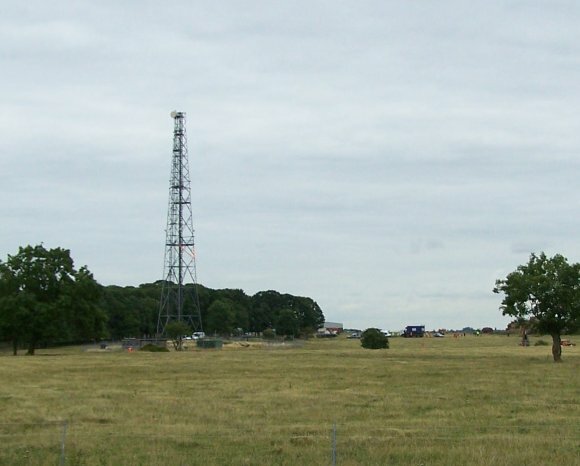 The Chelveston tower was sold by formal tender on 15th January 2009 by Defence Estates to Chelveston Renewable Energy (CRE), who owned the surrounding former MOD site. 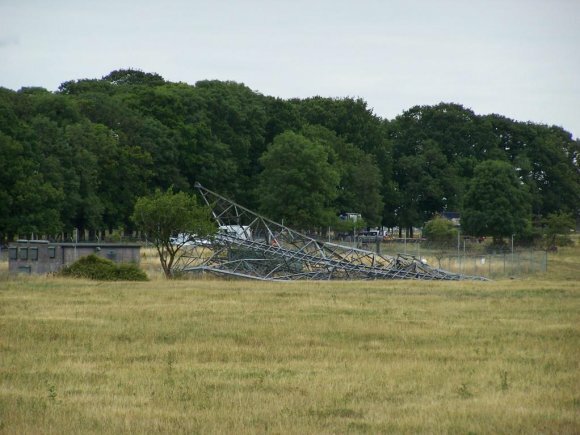 It was 68m high, being a simple girder lattice tower with 3 platforms or stages, having 4 aircraft hazard warning lights around the 1st stage and a further light mounted on the top. These could be seen for miles around e.g. from Finedon when heading south on the A6 and from Kimbolton when heading west on the B645 (former A45), letting many a local traveller know they were getting near home! 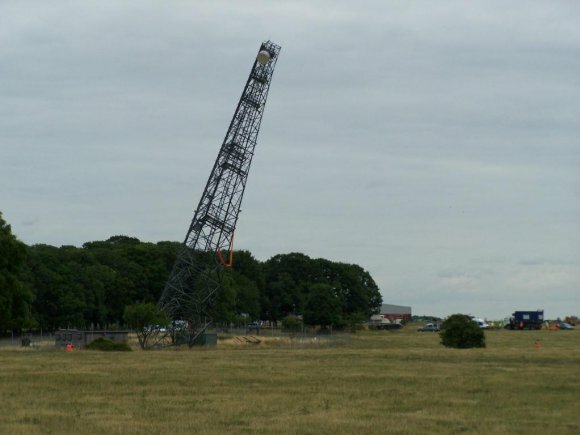 During the Planning Appeal against the decision to refuse the CRE Wind Farm, the Planning Inspector, in allowing the appeal, added a condition that the tower was to be removed before the turbines were erected, so as not to dominate the nearby housing at Chelston Rise. Accordingly CRE arranged for the demolition to take place on morning of Saturday 10th August 2013, with the contract awarded to A R Demolition Ltd. The lower bolts were cut through and steel wires attached at the height of the 1st platform to guide it in the desired direction. Once on the ground it was cut up into sections and removed from the site that afternoon. The UCB currently remains in place. (With thanks to John Bennett, who served at RAF Chelveston during the 1970s). Cutting through the lower bolts.